The good news: The ridge breaks down and we get snow. Figure 1. Snowfall totals through Thursday afternoon. But hey at least we get some colder temperatures and a little bit of snow. The snow should start falling early Wednesday morning and finish up by Thursday night. But how much snow? 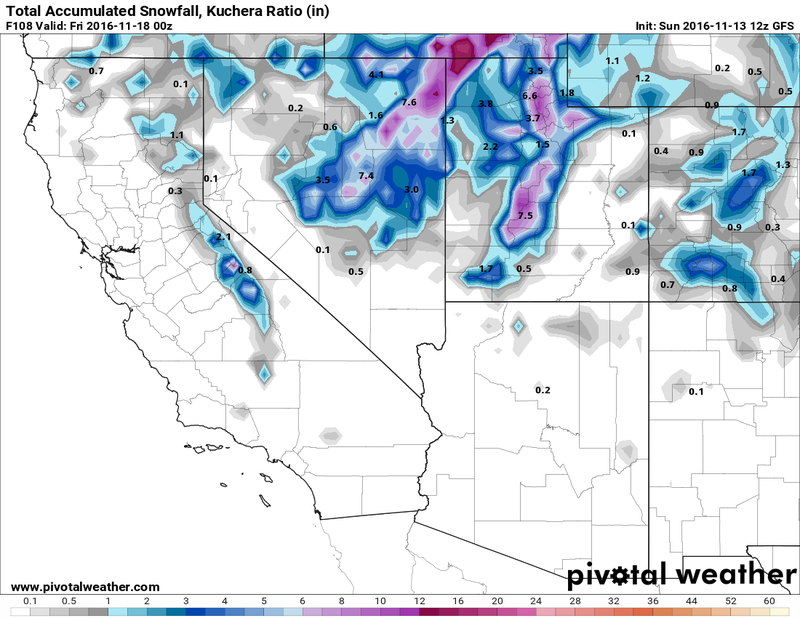 A dusting to about 6 inches of snow is expected with the 'higher totals' in the southern Sierra (Figure 1). Figure 2. Precipitable water valid Monday late morning. There is good Pacific moisture associated with the storm (Figure 2), but the trajectory of the storm and a strong push of very cold air on the backside of the trough doesn't allow the deepest moisture to affect the Sierra (Figures 3-4). 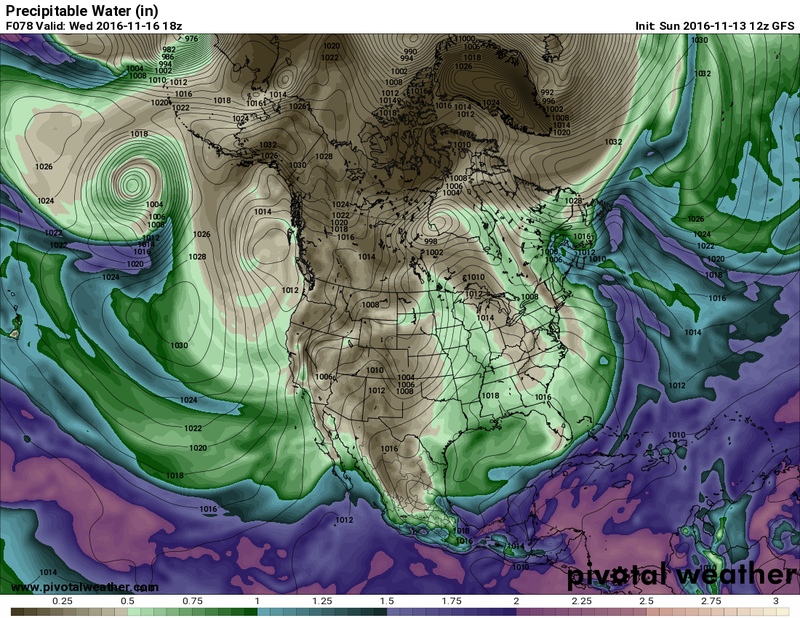 You always need a good moisture source and strong lifting (orographic, frontal, convection) to dump snow in the Sierra, and this setup just doesn't provide that. Figure 3-4. 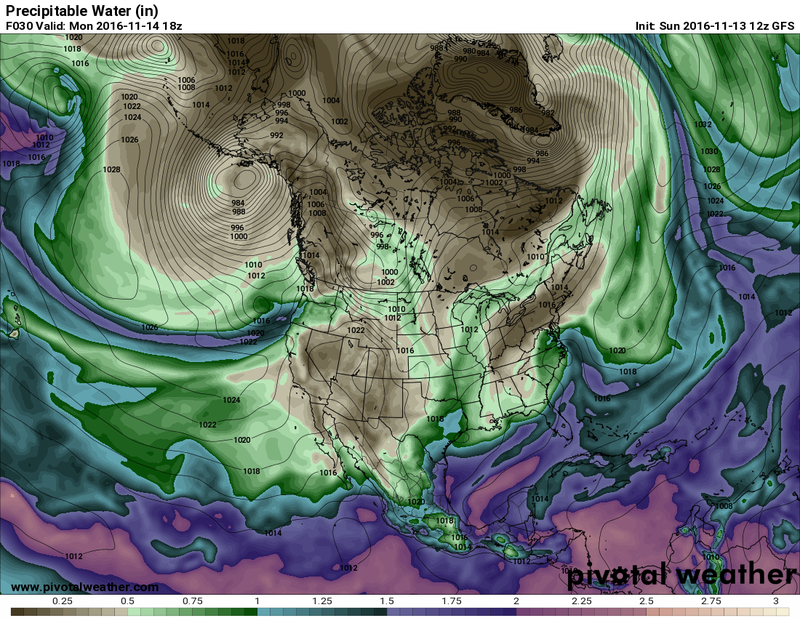 Top: Precipitable water valid mid Wednesday morning. 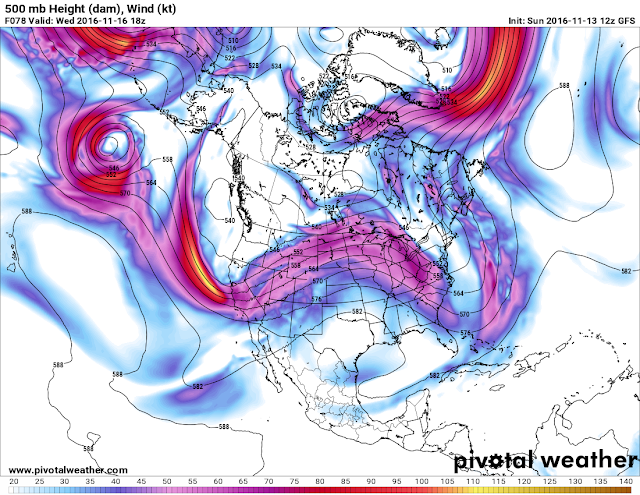 Bottom: 500mb heights and winds valid mid Wednesday morning. Notice the strong N/NW winds on backside of trough over the eastern Pacific. There is a slight chance the storm track/trajectory changes and we get more snow, but I'm not holding out much hope. The Pacific remains active with a few more storms traversing the east Pacific and across the western United States. We'll keep an eye on those and hope for the best. As many of you know, once the ridge breaks down, we need as much snow as possible before it builds back in. Let's hope the Pacific provides us with a good base during this window of opportunity.